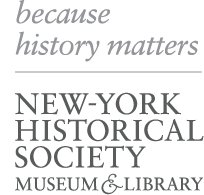 ﻿ New-York Historical Society | History on Broadway! Explore American musicals as historical sources in this engaging five-session residency. Explore American musicals as historical sources in this engaging five-session residency. Students build critical thinking and media literacy skills by analyzing songs from musicals along with primary sources and secondary texts to deepen their understanding of American history. Students will consider the challenges people faced in the past and will assess the validity of the examined musical as a historical source through role-playing and other creative exercises. Residency units are led by a talented museum educator and include a teacher curriculum guide. This innovative approach to teaching and learning supports the Common Core Learning Standards and aligns with the NYC Social Studies Scope & Sequence, Passports to History, and Blueprint for Teaching and Learning in Theater. A History on Broadway residency costs $600 per class for schools within New York City and $750 per class for non-NYC schools, plus a small planning session fee. A class can have up to 30 students, and a classroom teacher must be present throughout the program. Each session is designed to fill one class period (up to 60 minutes). A minimum of two class periods are required to participate. Each series begins with a planning session between the museum educator and associated teachers, which costs $120 for NYC schools and $150 for schools outside the five boroughs. To book any visit, there is a two class minimum per day (three classes outside the five boroughs). There is no maximum number of classes. An educator visits your school to meet with the participating teachers to introduce the program and review unit objectives, technology available in the classroom, and school and museum policies. The class watches or listens to a clip from an American musical along with a primary source, learning the skills used to interpret media and examine a song as a source. After reviewing the content and skills learned in the first lesson, students view and consider a second song to further their understanding of the musical’s interpretation of the historic era. They explore primary sources—such as photographs, paintings and documents—to gather more evidence on the topic. Building on the foundation of the musical study, students use theater exercises—such as role-play, improvisation, and playwriting—along with additional sources to expand their content knowledge. In the final session, students return to the musical to reflect and reevaluate it in light of the history they learned over the course of the series.